Wilson Lake is the smallest lake on the Tennessee River chain, located between Wheeler and Pickwick and stretching just 13 miles from dam to dam. The best tailrace fishing in the country occurs here below Wheeler Dam in the fall, with trophy smallmouth and largemouth fishing. I offer live bait trips here as well as artificial trips. The live bait trips are excellent for children and beginning anglers and are usually non-stop action. 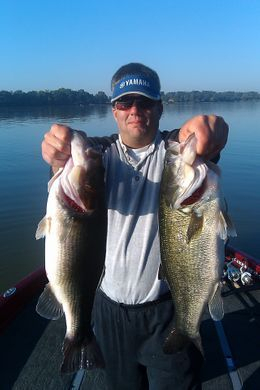 Wilson has great numbers and sizes of all types of bass and can be fished successfully year round. This is one of my favorite night lakes in the country as well and trips are offered after dark. This past year saw numerous clients catch tons of big fish on Wilson Lake. Spring and fall are the best times to find big bass on Wilson Lake. Popular techniques and lures include topwaters, crankbaits and plastics.